To install the desktop application, see the desktop application installation page. 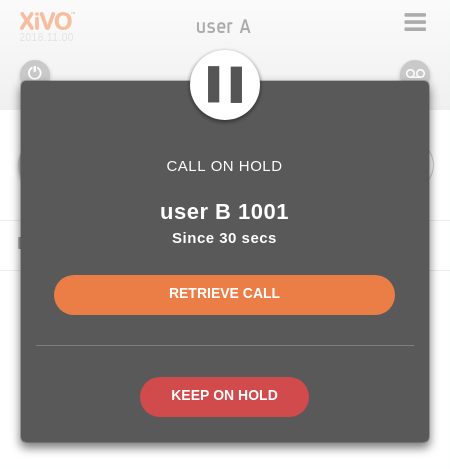 What is the XiVO UC Assistant ? A Remember me option is available at prompt page to keep you signed in, when you want automatic login. You can use the search section to lookup for people in the company, results will display all information known for the user (phone numbers and email). You can either click on number to call, or click on copy button to put the number in your clipboard to paste it elsewhere. 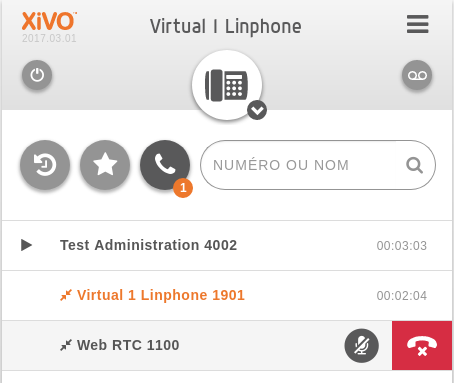 To enable this feature, you must configure the directories in the XiVO PBX as described in Directories and Views. Once you choose an action, you just need to apply on clicking on associated button. If calls are redirected, the forward number will be shown under your name. Nevertheless, there is a precedence, if DND mode is enabled and also call forwarding, calls will be rejected. If forward on miss call and all call forward are enabled, all calls will be forwarded to number configured for all call forwarding. Click on the star to put a contact in its list of favorites. Favorites must be configured in the XiVO PBX as described in Favorites. From top-right hamburger menu, it is possible to display additional actions to handle you personal contacts. 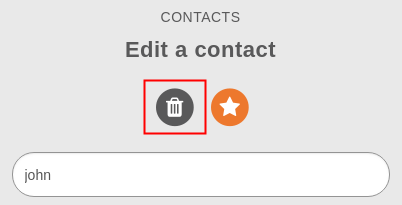 You will be able to create, delete all, import and export personal contact that you will be either able to search from toolbar or find them in favorites panel if starred. 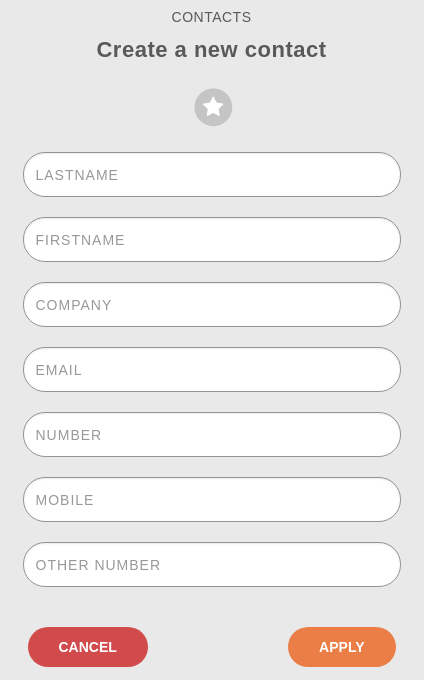 Just fill wanted fields (such as name and number), click on star if you want this contact to be displayed in favorites panel. It is not possible to have twice the same personal contact, at least one field must differ. It’s also possible to create a personal contact from call history by hovering a call item and so have pre-filled fields. Once clicked, you are redirected to edition pane where you just fill wanted fields. Once clicked, you are invited to confirm or not the deletion of this contact. 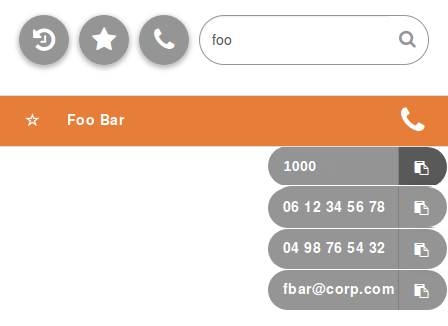 From menu, you can upload a .csv file that contains all the data of your personal contacts. You can either use a file exported from this same interface or create yours. 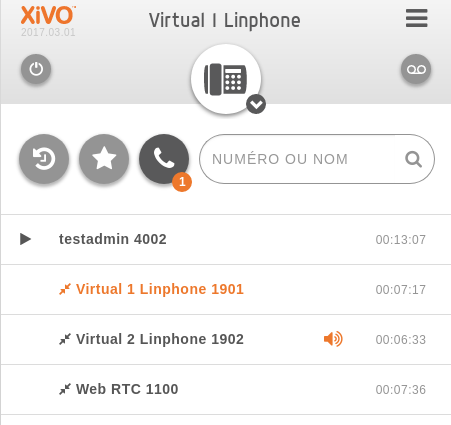 File exported from previous xivo-client is also compatible with UC assistant. By default, reverse lookup is enabled for personal contact display on incoming calls. Configuration is set to display firstname and lastname if number or mobile matches an existing personal contact. As these features are closely linked to the phone to work, you must check Supported phones for UC Assistant and CC Agent and follow the Required configuration page. 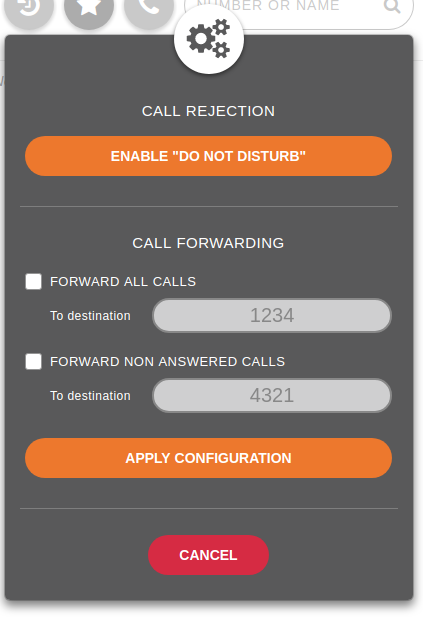 You can be notified if you forget a call in hold for a long time, see configuration section. When joining a conference, either as an attendee or an organizer, the UC Assistant will display specific informations about the conference you are joining. Put the conference on hold. Other attendees will not hear any hold music but will not be able to hear you neither you will be able to hear the conference room. As an organizer, you will be able to mute and unmute all other attendee in the conference room. Attendees name, number and timer are displayed below the conference name. Kick out an attendee. A message will be played to the kicked out attendee before leaving the conference. 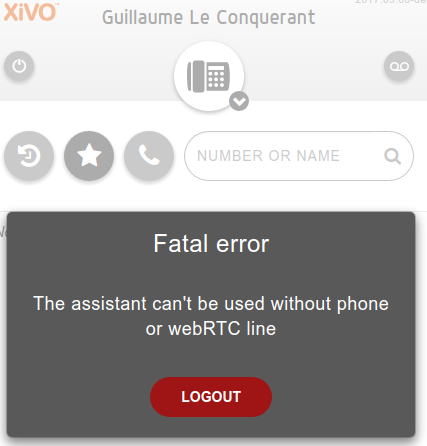 The UC Assistant can be used by users with WebRTC configuration, without physical phone. For configuration and requirements, see WebRTC Environment. To test your microphone and speaker, you may call the echo test application. After a welcome message, the application will echo everything what you speak. Dial the *55 number from your Desktop Assistant. You should hear the “Echo” announcement. After the announcement, you will hear back everything you say. If you hear what you are saying it means that your microphone and speakers are working. Press # or hangup to exit the echo test application. Two progress bars show the volume level of the speaker and the microphone. It certifies that the audio flow has been sent. This experimental feature needs to be enabled in the configuration (see Experimental video call feature). 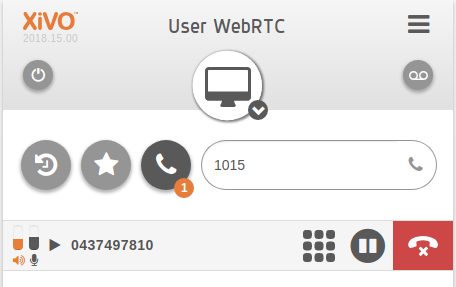 When logged in as a user with a WebRTC line you can initiate and receive an audio/video call. The video call is possible only from your favorite contacts or the directory search result through the video camera icon. 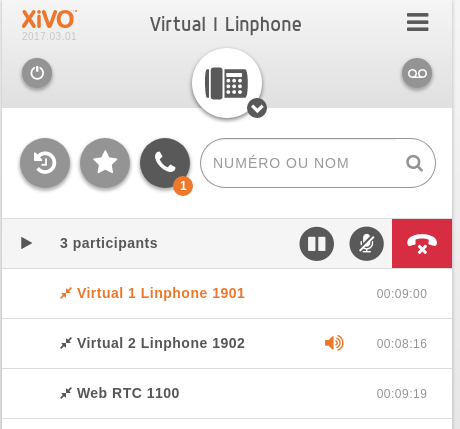 When the called user doesn’t support video calls, call is established as audio only. In the current implementation you can put the call on hold, go fullscreen, but for the moment you can have only one video call at a time and you can’t transfer the video call. Conference is not supported yet.